Peggy Willenberg, Melanie Metz, MaryLynn and I decided to play the warm front this day and ended up heading down Hwy 169 from the Twin Cities to Algona, IA. 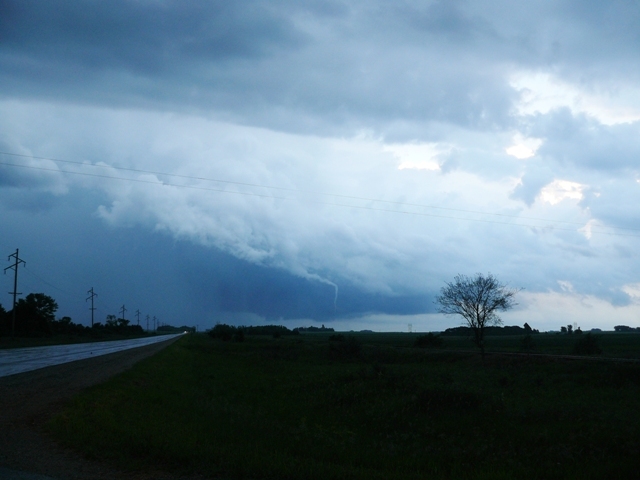 On the way down, we did pass a developing storm with a VERY nice lowering near Elmore, IA. 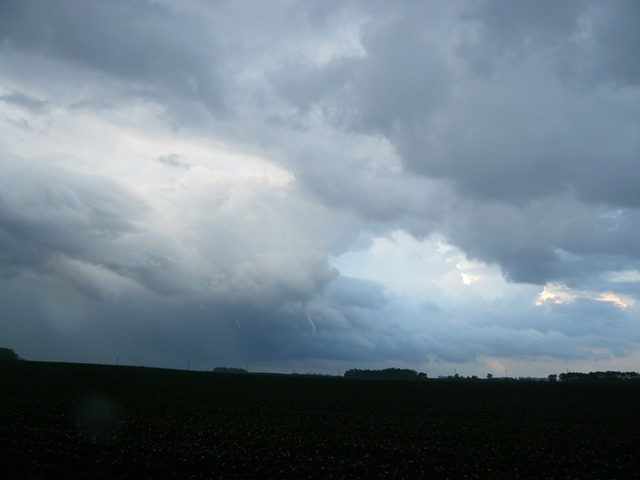 This storm was well north of the warm front and appeared to be moving quickly to the northeast into a not as favorable environment, so we continued south to Algona and sought after a storm that was looking impressive on radar as well as being right on the warm front. This storm did produce a couple of funnels east of Algona and then seemed to be undercut by the warm front and lag behind, therefore gradually weakening as the fast moving warm front continued into southern MN. Well, wouldn’t you know it, the storm that we passed up quickly became tornado warned near Blue Earth, MN. We waited around for several radar scans on the southern cell and then bailed towards the cell heading towards Easton, MN. The storm had reports of a few funnels and a tornado near Easton before we got there, but our crew managed to get on the storm between Easton and Wells where we witnessed a funnel ¾ of the way to the ground. It did not look like this touched down at that time. After lifting, we followed the storm past Wells, witnessed another funnel and then the tornado around 2 miles west-northwest of Alden, MN. It was interesting that the storm that produced the funnels and tornado near Easton and Wells was not the storm that produced the tornado near Alden. The storm that produced the tornado near Alden developed to the south and quickly became severe. The tornado formed on the eastern part of the storm, which was interesting because the inflow was out of the southeast of the storm and did not seem to be directly into the action area. The low level shear this day was very high while the deep layer shear appeared to be not as ideal. Therefore, the storms that went up were not supercells but were quite low topped with hardly any lightning and tops that had a difficult time exceeding 30K feet. Basically the tops could not reach far enough past the freezing level to produce any hail and even lightning. It was very interesting to see these low topped storms have so many lowerings, wall clouds, funnels, and overall motion. First funnel cloud of the day near Algona, Iowa. Second funnel cloud on a different storm further to the north near Easton, Minnesota. 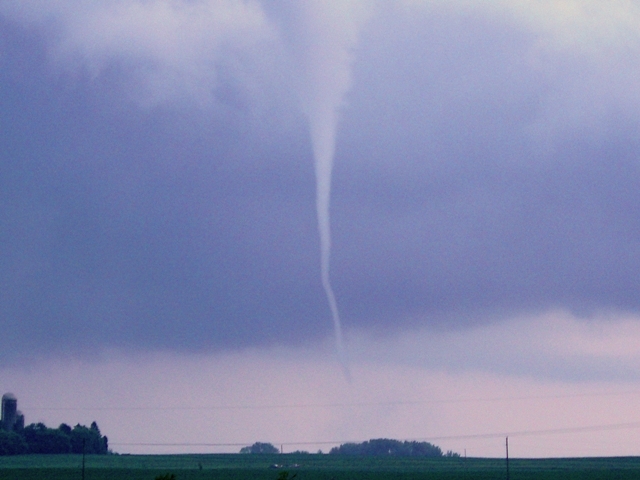 Third funnel spotted on the same storm further to the east near Wells, Minnesota. Fourth funnel cloud a short time later near Wells, Minnesota. Fifth funnel cloud on a different storm moving up from the south between Wells and Alden, Minnesota. Short lived tornado around 2 miles to the west of Alden, Minnesota. A second picture of the tornado 2 miles to the west of Alden, Minnesota. Tornado roping out near Alden, Minnesota.